The standard Copy and Paste commands are available in many areas in SysCAD. However there are some special uses of copy and paste, especially in relation to tags. In any pop up windows or dialog boxes, the changeable fields can be edited using the standard windows Cut, Copy and Paste commands. Highlight the required characters then use Copy <Ctrl+C>, Cut <Ctrl+X>, Paste (Ctrl+V) or Undo <Ctrl+Z> as required. In SysCAD 9.2 Build 135.13032 and later users may copy flowsheets or sections of flowsheets or Text and paste this to other flowsheets or projects. A Full Tag consists of the Unit Tag and the Field Tag. For example "P_001.Qm (t/h)" or "CCD_1.RqdUFSolids (%)". When referencing SysCAD tags in some SysCAD windows, for example MS Excel Report, PGM or Chemical Reaction files, full tags are normally required. To obtain a full tag, the easiest way is to copy it from the SysCAD Access Window. Open the Access Window for a Feeder-Cross Page Connector unit by right clicking on the unit from a Graphics Window. (In this example, it is unit - MakeUpWater.) Select the tag Qm_Reqd by left clicking on tag's text string to highlight it, press <Ctrl+T> to copy the full tag to the clipboard (in this example, it is tag MakeUpWater.Qm_Rqd (kg/s)). To place the tag onto the Trend List View of a Trend Window, left click on an empty row and press (Ctrl+V) to paste the tag. From the Access Window, left click to select the tag(s) to be copied, right click on the tag to bring up the quick pop up list. Choose Copy Full Tag to copy the Full tag name [e.g. MakeUpWater.Qm_Rqd (kg/s)]. 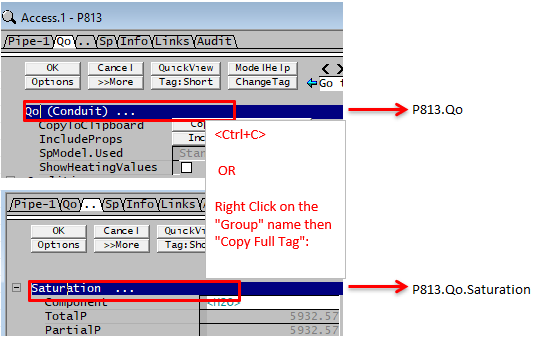 Copy Tag will only copy the Field Tag. For example "Qm (t/h)" or "RqdUFSolids (%)". The Unit Tag is NOT copied. This is useful when the user is setting up a Table report in Excel or writing a Model Procedure. Choose Copy Tag to copy just the field tag. 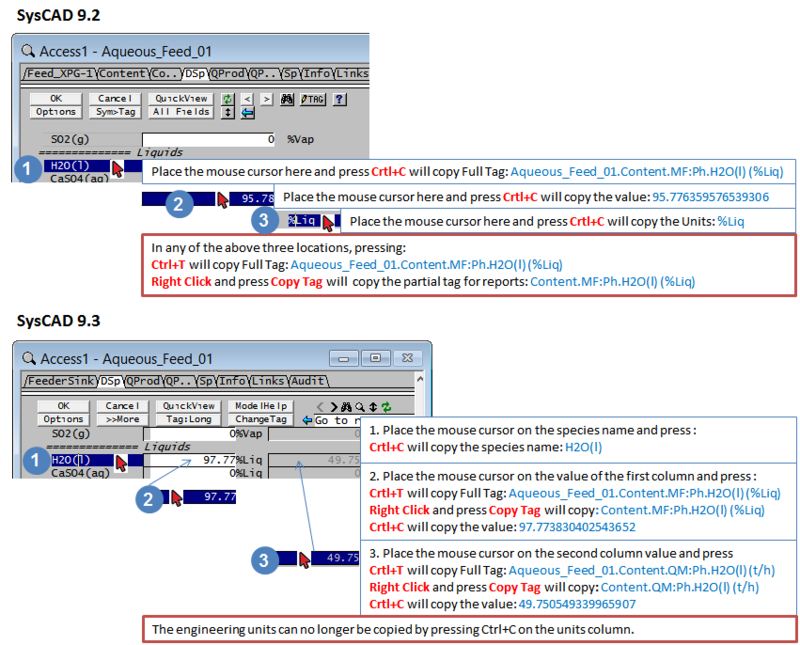 To copy multiple tags, select the tags by dragging with the mouse button to make a block and press <Ctrl+T> to Copy or right click and choose Copy Tag if full tags are NOT required (eg, when building a SysCAD report). When pasting multiple tags into Excel or text files, press (Ctrl+V). To paste multiple tags onto the trend page, the same block (or bigger) must be marked before pressing (Ctrl+V) to paste. For example, five tags from the access window were highlighted and copied onto the clipboard, to paste the five tags onto the trend window, highlight five empty rows on the trend window and press (Ctrl+V). If only two rows were highlighted, then only two tags will be pasted. Fields in a Trend Window can also be copied and pasted. To do so, click to highlight a tag or value, press <Ctrl+C> to Copy and (Ctrl+V) to Paste. If the field already contains data, pasting information to this field will overwrite the original data. If a value is to be pasted into ten cells, highlight the required cells and press (Ctrl+V) to paste. This works for min and max values in the trend window. NOTE: Copy and Paste commands are also available from the Trend Window Right Click pop up list. This is available in SysCAD 138 or later. Right click on Access window tab page title has a new context menu to copy the tag providing a convenient way of copying and pasting tags for use in referenced models. This would be the model tag for the first tab page, and the sub-model (eq Qo) for subsequent pages. This is useful when entering tags for Composition Fetch: for example, we need to enter P813.Qo as the source of the composition fetch. We can copy this partial tag by right clicking on the "Qo" tab name, then select "Copy Full Tag", as shown below. This is available in SysCAD138 or later. In the Access window, pressing <Ctrl+C> or right click on start of a group of tags (eg Qo...; QFeed...) can now be used to copy the tag for the group. This page was last edited on 15 April 2019, at 19:06.